LACRIME Di ROSPO: Moku Hanga a Roma! 22-24 May. Workshop in Japanese woodblock at Betterpress labs in Rome. Moku Hanga a Roma! 22-24 May. Workshop in Japanese woodblock at Betterpress labs in Rome. It looks like it's official. Friday May 22nd through Sunday May 24th. 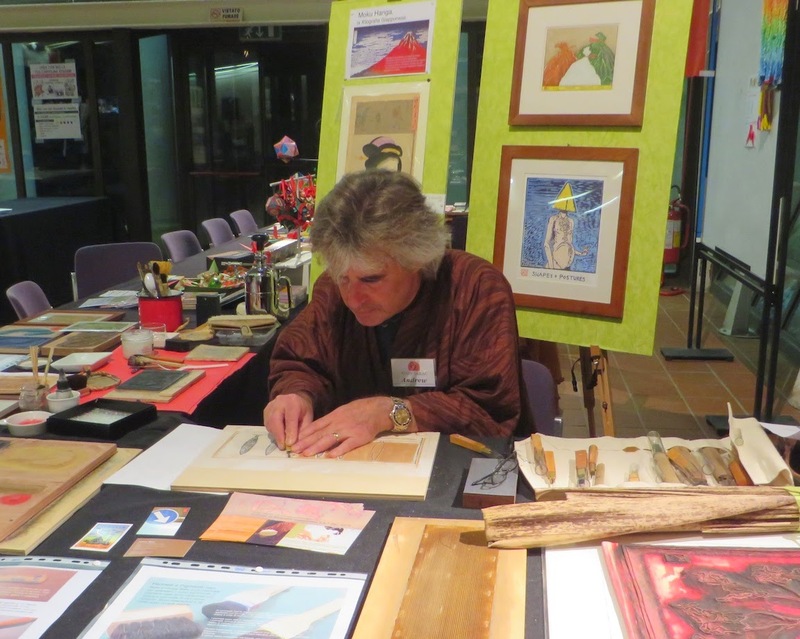 I've been invited to teach a three-day intensive course in woodblock printmaking in Rome. Betterpress lab ( betterpress.tumblr.com/ ) is a letterpress and printing/bookbinding artist cooperative and studio in Rome run by Giulia Nicolai and Francesca Colonia with whom I had the pleasure to meet and work with earlier this year. They have a small, charming studio near Trastevere that is slowly filling with type cabinets and presses but there's enough room to host 5 students and in 3 long days I hope to be able to teach a basic, traditional Japanese woodblock technique: A two block, 3-4 plate print using a key block and 2-3 colors. Day 1: An introduction to the history of Japanese woodblock prints. The rise and culmination of the art in the works of Ukiyo-e, a more focused nod to contemporary international artists working today in moku hanga and then a jump in to the techniques themselves. Materials needed and image manipulation and transferring images to the block(s) for carving. I hope to get everyone's drawing transferred and start (and hopefully finish) the keyblock on the first day. Registration with the the Kento registration method. Floating and fixed kentos. Preparation of woodblocks and paper. Papers for traditional printing (Western, Washi, and other). Printing with simple and advanced techniques with a demonstration of bokashi printing. We'll carve the 2 color blocks.....and take test prints to check for registration and cleanliness. Pigments, rice paste, gomazuri and Barens. Demonstrations of Bokashi printing, blind embossing, back printing, using a carry sheet. We'll share Ball-bearing, Murasaki, and my twisted cord barens while trying to print on different papers. Each student should be able to finish a small run of a multi-block print as well as experiment a bit with color variations. Hopefully there will be time to make a baren and demonstrate how to fix mistakes and sharpen tools. Class will be in Italian (or something resembling Italian) and English. Class size is limited to 5 participants: (It's a cozy space).